The first couple of items from my Lounge-Around-the-House wardrobe are done: the long-sleeved top (Burda 1/2013 #119) and the trousers with the fold-over waistband (Burda 1/2013 #112). I must say, I am really liking this shirt. I already have two more cut out ready to sew. Construction still happening around this house. Will it ever end? 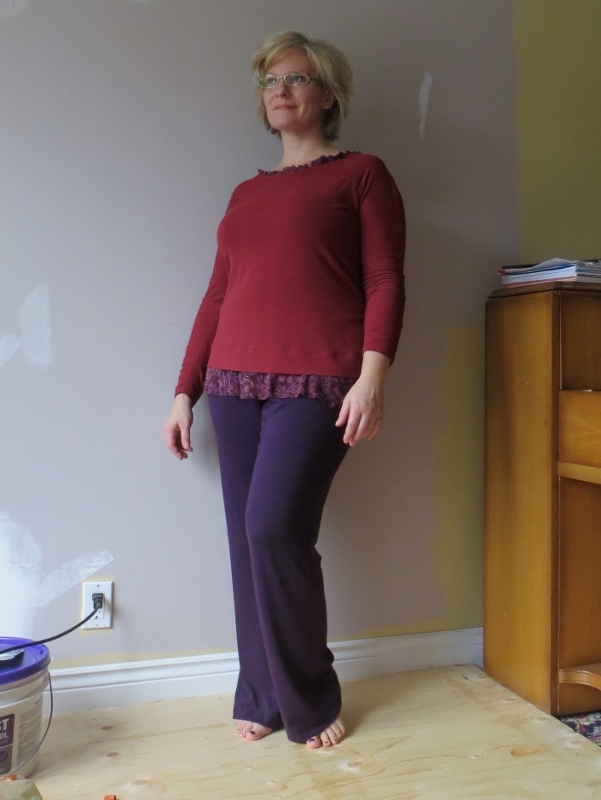 I like the fit of it – it’s not too snug or too loose – and the bias ruffle around the hem and neck are different from anything I’ve seen in tops. I like it in the contrasting fabric instead of tone-on-tone as per Burda. 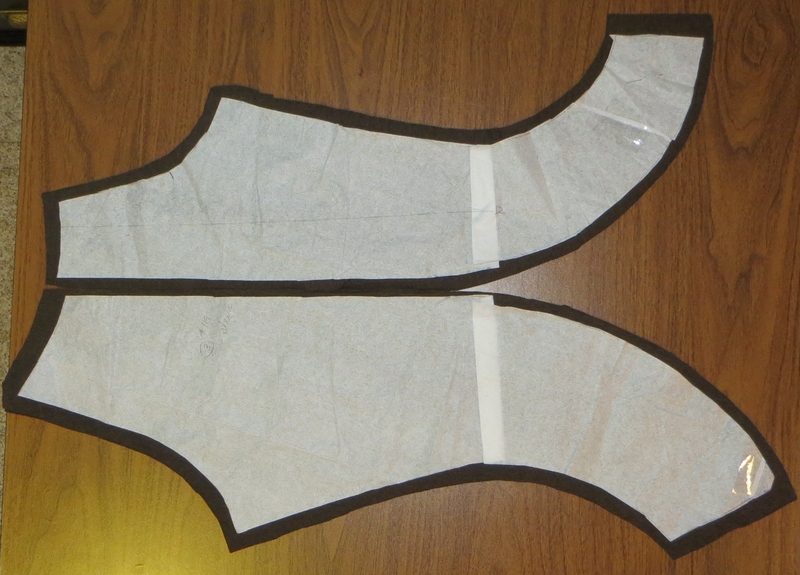 The bottom bias strip is about 3 inches wide. The neck trim is a 2-inch wide bias strip, folded in half and stitched to the neckline edge. The rayon knit from EOS is just divine. I love the quality of it. I would be happy with a stash of it in every single colourway. 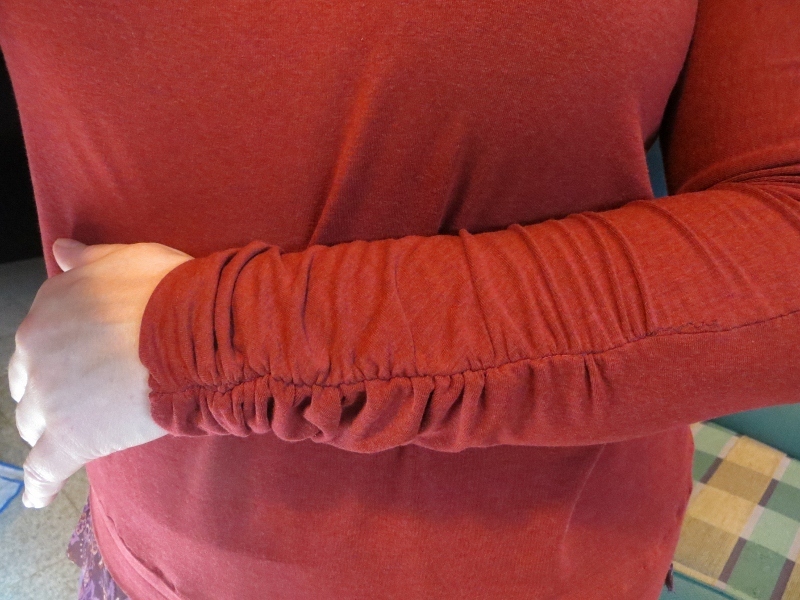 But back to the top: imho, the best part is the sleeves. They fit beautifully – just like a second skin – not tight and not loose – and the outside ruching is a nice touch. 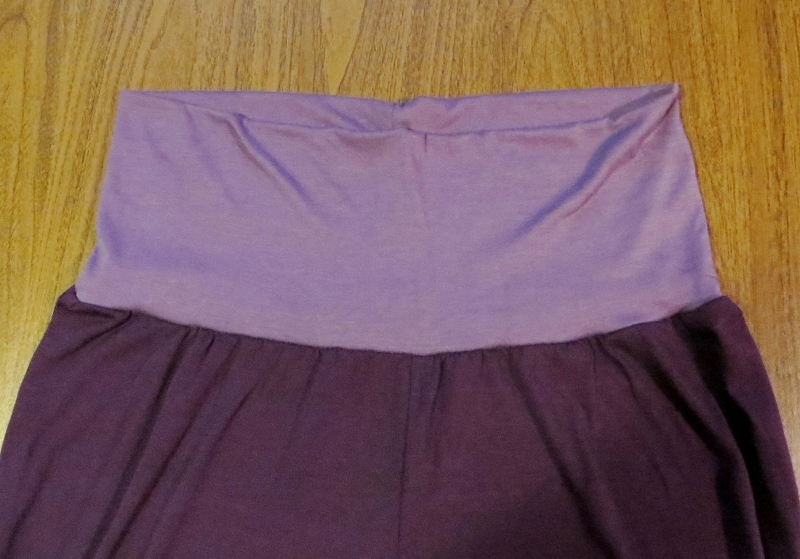 I didn’t quite have enough fabric for this top, so I split the sleeve down the centre on the straight grain and cut it out as two separate pieces. That sleeve piece is a fabric hog as is. It worked perfectly. Actually, I think I preferred cutting the sleeve this way because it eliminated the dart at the top of the ruching and running it into the seam all the length of the sleeve. In my mind’s eye I can see a fussy little pointy piece of fabric that won’t lay flat at the end of the dart. So I’m happy with my fix. Here’s a pic of the next one cut and ready to assemble. The trousers are super comfy. 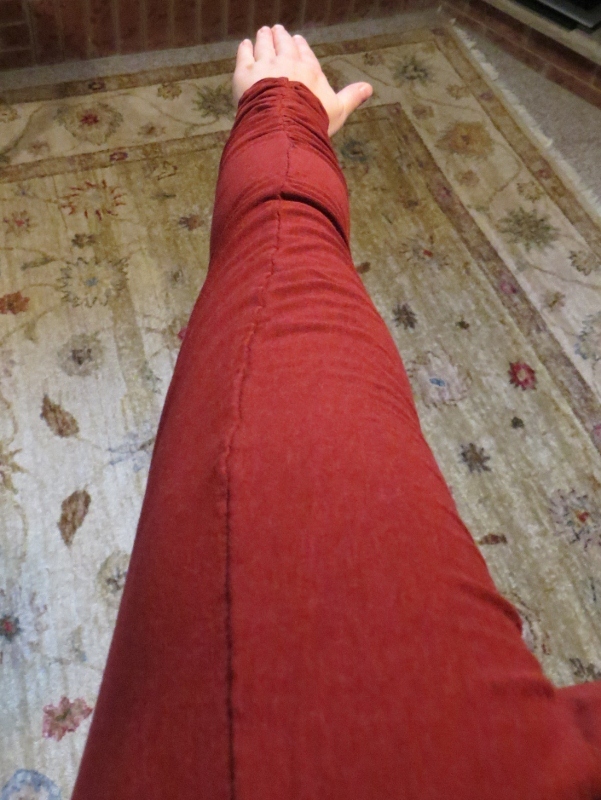 I added some length through the back crotch curve, and the fit is great. I’m really loving how Burda’s trousers fit these days. That, and the little tricks I’ve learned over the last year about crotch depth and that crucial POM 2″ up from the bottom of the crotch. 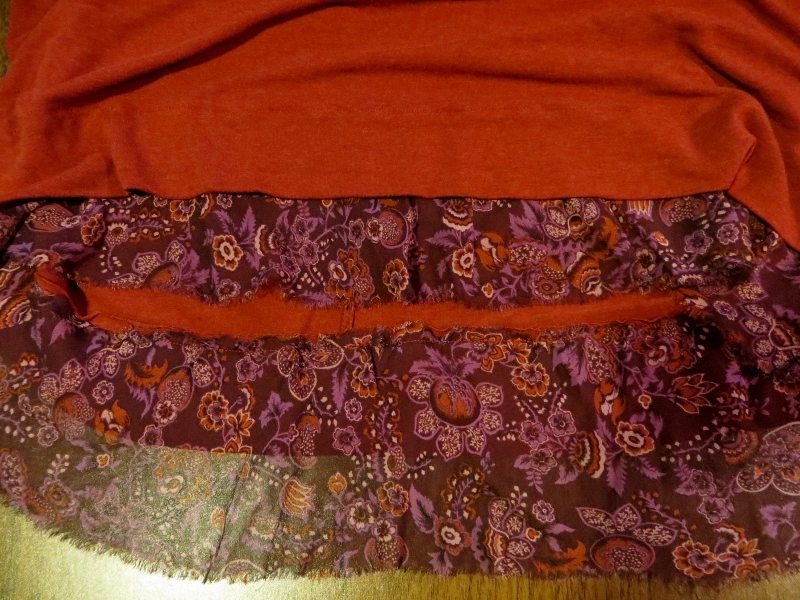 The waistband is a rectangular piece of fabric about 14 inches wide, so it folds over. I cut it from the lavender knit as I had run out of the dark purple. Did I mention they’re super comfy? Perfect for hanging around the house with a warm cup of tea. Oh yes I like both … And the sleeve ‘treatment’ ….very cool. How’s your LATH going now you are gathering perfect garments to do it justice? I find I’m wearing the pieces from this set a lot. Super comfy and cozy. That’s a seriously stylish lounging around outfit! I think your modification of the sleeves is spot on, too. oh my! 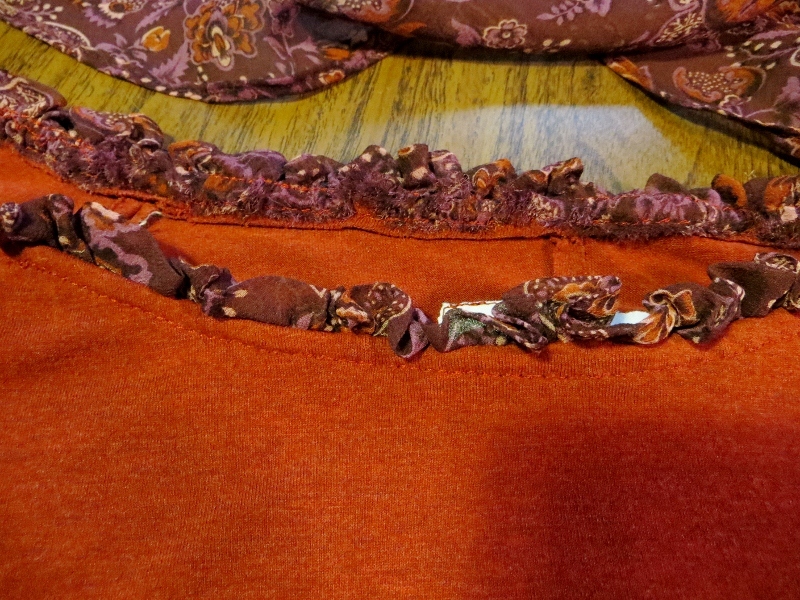 I remember tracing that top pattern waaaay back when it came out – I never sewed it up… I like your LATH stuff, best I find that tracing..
What a good idea to split the sleeves in two. I made this one once and you’re right about it being a fabric hog. These two pieces make a great looking, casual. comfy outfit. Love the color combination and the way the contrast trim on the top pulls it together. Comfy AND interesting! Glad your sewing mojo’s back. I think I too need to make more knit tops that aren’t too tight. Yes, even I get unsightly rolls. Thanks bra. Not. 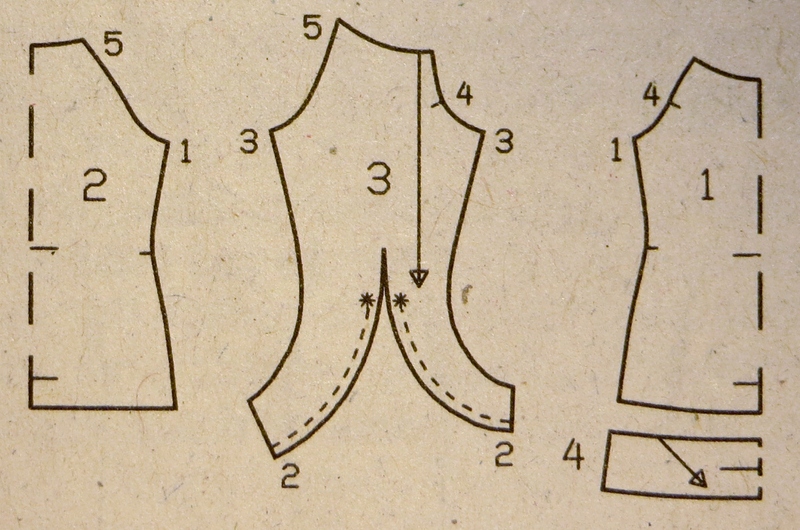 And must remember that pants fitting tip when I finally get around to tackling pants. Looks comfy! Even though I’m usually doing grandstanding vintage makes, I actually need pants like that to sleep in, so I’ll check out that pattern.